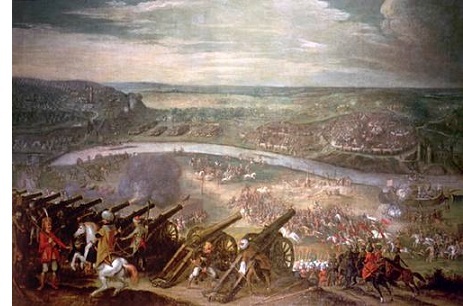 Gates of Vienna (1683) - The Battle of Vienna (commonly referred to as the "Gates of Vienna") was fought on September 11 & 12, 1683, and would be the last serious attempt by the Turks to conquer Europe. It came about 150 years after Suleiman the Magnificent made the first Ottoman attempt to take the city (Vienna had been an Ottoman target for a long time). The sultan this time was Mehmet IV, and he wanted to knock out the Holy Roman Empire all at once by striking at its capital. Capturing Vienna would also give him control of the Danube River, an important weterway cutting across Central Europe. Mehmet declared war on the Holy Roman Empire more than a year earlier in August 1682. But the logistical support required to march an army from the western border of the Ottoman Empire to Vienna was substantial. This gave Leopold I, the Habsburg ruler of the Holy Roman Empire, time to prepare for the invasion. He strengthened the city's defenses and sought alliances with other states in Europe. In March of 1683, he signed the Treaty of Warsaw with John III Sobieski, King of Poland and Grand Duke of Lithuania (at the time Poland and Lithuania were a confederation). The two agreed to come to each other's aid should either be attacked by the Ottomans. Well the Ottomans, under the command of Grand Vizier Kara Mustafa, arrived at the gates of Vienna in July with an army of about 100,000. Only about 15,000 Viennese troops, led by Count Ernst Rüdiger von Starhemberg, were inside to defend it. Their job was simply to hold out long enough for help to arrive. Mustafa demanded the city surrender. Rüdiger refused. News had arrived ahead of the Ottomans of the destruction of Perchtoldsdorf which had surrendered to Mustafa. So on July 17, 1683 the siege began. 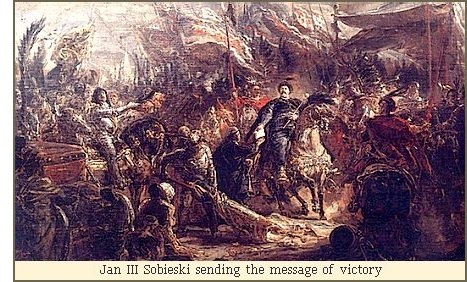 The following month, King Sobieski honored the treaty and marched from Kraków with 23,000 men. At the same time, the German states north of Vienna were mobilizing as many soldiers as possible to come to the aid of Vienna. They raised about 60,000. In the meantime, Ottoman soldiers were attempting to tunnel beneath the city's walls with the intention of planting explosives and blowing them up. Many Historians speculate that Mustafa's desire to capture the city and not destroy it delayed the assault significantly. But the wealth of Vienna was too tempting to dismiss. In early September, King Sobieski crossed the Danube and met up with the army that had come from the German states. He took overall command of the relief force which became known as the Holy League. It arrived at Vienna just in time to see the Ottomans breach the city's walls and prepare for their final assault. Grand Vizier Mustafa now had to make a strategic decision. He divided his army into two forces; a smaller elite force prepared to penetrate the walls and take the city, while the bulk of the army was tasked with repelling the Holy League. The battle outside the city began in the evening of September 11th and raged into the morning hours of the 12th. Just before dawn, the Ottoman army went on the offensive with the goal of breaking through the lines of the relief army. However, after a two month long siege and the loss of many troops trying to take Vienna, the Ottoman army was at a disadvantage against the fresher European soldiers. The Holy League concentrated its attack on the Ottomans right flank and by the early afternoon it gave way. At the same time, the Polish cavalry (knonw as hussars) captured the nearby village of Gersthof and prepared to launch its final attack from there. By late afternoon the Holy League's infantry weakened the enemy lines and the hussars charged the field with the goal of ending the battle. Mustafa tried to order an organized retreat and regroup in a more defensible location, but many Ottoman soldiers were already abandoning in large numbers. By early evening King Sobieski was ready to finish the fight. The Ottoman army had been reduced by death and desertion to the point where it was capable of being surrounded. The Viennese force that had been defending the city wanted to partake in the victory and poured out of the gates to join the fight. Vizier Mustafa, seeing the battle was lost, ordered the deaths of 30,000 Christian hostages and fled. He was executed though by Sultan Mehmet a couple months later for failing to capture the city. Many see the Ottoman loss at Vienna as the onset of the long gradual decline of the Turkish empire.